Park Falls, WI (May 30, 2017) – The Savannah College of Art and Design (SCAD) bass fishing program (men’s and women’s) epitomizes how far the scholastic level of the sport has come. Led by full-time coach Isaac Payne – himself an avid angler and former SCAD grad – the team has placed both male and female athletes into several national championships over the past four seasons. A case in point: SCAD standout Sean Hall – a former High School World Championship finalist attending SCAD through a bass fishing scholarship – has already qualified for every college championship available for the 2017-18 season. Hall, along with teammate Justin Roberts, are the newest members of the St. Croix college fishing program, poised to make headlines this month at Alabama’s Pickwick Lake, where they’ll compete in the BoatUS Collegiate Bass Fishing Championship, presented by Cabela’s. The team recently joined forces, and this event marks the first time they’ll compete together. 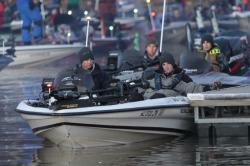 Collegiate bass fishing is unlike any other sport. Players often have varied backgrounds, and experience levels and practice sessions are anything but textbook. In addition, teammates are frequently paired with little knowledge of the other’s strength and weaknesses, yet their destiny lies in each other’s casts. Hall and Roberts see little difficulty in their recent pairing, and have spent considerable time preparing for the Pickwick event. “It’s getting to the point where we know each other’s move before it happens” Hall said. A scouting trip to the lake prior to the off-limits period proved productive, as the team located several schools of bass in shallow waters loaded with spawning shad. While the duo admits such a pattern won’t likely prove productive during the pre-summer event, knowing where a large majority of the bass were previously located could prove helpful when hunting current hot-spots. As with all SCAD bass athletes, a large percentage of preparation lies in regimented practice periods 2-3 times weekly, led by Coach Isaac Payne. Even Payne, however, cautions against treating competitive fishing like other sports, and focusing solely on the act of playing. Instead, the mental aspect of practice can often be key, as can orderly duties like boat preparation and tackle maintenance. The key, Payne stresses, is that we’re all students of the game, constantly learning, regardless of skill level or past accomplishments. Payne encourages all anglers on the team to constantly add input, helping broaden the mindset of all players. Both on and off the water, Hall and Roberts continue to communicate about nearly every variable in their lives, from tests and essay papers due in their classes, to discrete creek channel swings found on topo maps. The two use each other as a sounding board, enforcing the principle that two heads are better than one. A quick trip to the nearby Savannah River proved a great testing platform for new gear, including St. Croix’s Bass X series and Mojo Bass rods. True to their team-style methods, Hall and Roberts dissect each new body of water by sharing the front deck and fishing rods during practice, allowing each angler to simply pick up and cast whatever’s on their mind at a given time. For the upcoming Pickwick event, that will likely mean cranking ledges, an offshore fishing method where rods featuring forgiving actions often claim the prize. “It’s gonna be all about the Big Crankster” Roberts declared, admitting his favoritism for St. Croix’s 7’8” Mojo Bass Glass model, designed specifically for winding big plugs. Since the team believes the event will be dominated by offshore cranking patterns and ledge fishing, they’re prepared to spend the majority of their practice time off-shore. After power-fishing with cast-and-retrieve style baits, however, the pair plans to mop up more bass with a swing-head jig. The technique was responsible for a recent high finish for Roberts, and has become a major confidence builder on Tennessee River impoundments. Here, the Bass X 7’1” medium-heavy casting rod, with a faster action, will get the nod. Think, test, tinker, repeat. As the team of Sean Hall and Justin Roberts focus on the fishing, they’ll need not forget the primary reason they came to SCAD: a degree from one of the premier design schools in the country. Again unlike other collegiate sports, competitive fishing often requires athletes to be away from class for a week at a time, resulting in major strains on their schedule. Coach Payne turns up the heat, requiring a 3.0 GPA to stay eligible for his travel team; today, the SCAD men’s bass team carries a cumulative 3.3. In the end, Sean Hall and Justin Roberts are ready. They’ve prepared tackle, discussed a game plan and worked ahead in class. Equally important, this unique new division of competitive bass fishing has prepared them for the real-world, through team building exercises that are far more fun than just sitting in class. This entry was posted in Bass Fishing, college bass fishing on May 30, 2017 by ronniegarrison. 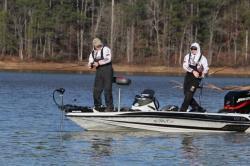 What Is Collegiate Bass Fishing? Collegiate bass fishing may never approach the interest levels generated by college football, but there’s evidence that competitive angling is following the footsteps of other popular NCAA sports as more and more colleges around the southeast add tournament fishing teams to their rosters, and a few even offer scholarships to attract young anglers who have already proven their skills competing at the high school level. The Bassmaster College Series Southern Regional, fished this past week at Lake Martin in central Alabama, drew an amazing field of 225 boats, one of the largest fields at any level ever attracted by a B.A.S.S. event, and by far the largest college event. The high school events have become a bit of a proving ground for young anglers, just as high school ball sports are for NCAA competition. B.A.S.S. has set up an All-American program that honors the top young anglers not only for their success in competition, but also for their character, leadership, and maintaining solid grades–a 2.5 average on a 4-point scale is required. Nominations are accepted from coaches, school administrators and parents, with the open period this year continuing through Feb. 15. Dave Precht, Editor in Chief of Bassmaster Magazine and Vice President of Publications for B.A.S.S., said there was a pent up desire for a college level circuit. He said several former All American high school competitors have quickly advanced through the college and regional tournament circuits to become members of the Elite Tour, generally recognized as the NFL of bass fishing, where a few of the most successful anglers earn six-figure incomes. This entry was posted in Bass Fishing, college bass fishing on February 22, 2016 by ronniegarrison.